Things to Do for Fall in Colorado Springs 2018 | Eat, drink, shop and run! Ask a handful of Coloradans what their favorite season is, and you may be overwhelmed with fall lovers. Fall is truly a special time of year in the Pikes Peak region with the weather cooling, and the leaves turning, there is still plenty of time to get outside and enjoy the weekend before the winter sets in. 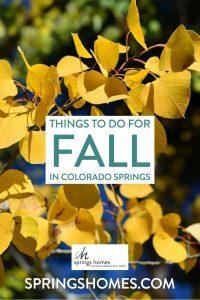 Here is the Springs Homes list of Things to do for Fall in the Colorado Springs area. Hurry, fall doesn’t last very long, so pack in as much as you can in the remaining weekends. Aspens on the Avenue is an annual fall art fair featuring a variety of artists including painters, glass blowers, metal workers, jewelers, wood-turners, and more with live demonstrations along West Colorado Avenue, between 23rd and 27th Streets. Hosted by OCC Arts Committee. The High Prairie Library in Peyton hosts this fun festival with arts, crafts, games, contest and much more. Date/Time: October 6th from 10 AM-3 PM. Mr. and Mrs. Claus are making a stop in Colorado Springs at the Sugar Plum Food and Gift Mart. See them with your Christmas list and stay for art, crafts, jewelry, boutique clothing, photography, toys, Christmas décor, and much more! Cost: $6, Youth 16 & under free! Join the 2nd Annual Fall Family Festival Kick Off Event. Hay rides, live music, food, vendors and more! Get ready for the contest of Rocky Mountain Giant Vegetable Growers to compete for The Biggest Pumpkin in Southern Colorado title. There will be a pumpkin patch where kiddos can pick out a pumpkin for a small fee, face painters and balloon artists. Come to Chatfield Farms for some fun fall activity. Family and children’s activities, local craft and artisan booths, food trucks and food vendors, beer and wine vendors, entertainment and live music. Don’t forget to bring a wagon to transport your special pumpkin! Cost: Non-Members: $10 Adult, $9 Student, Seniors, Military, $8 Members or Child (3-12), $6 Member Child, Under 2 are free. Advance tickets are available at a discount online. Discounted Corn Maze tickets can be purchased for $8. Pumpkins are an additional cost. The 2nd Annual Wolf Ranch Fall Festival is a free event for the public to attend, offering guests live entertainment from Flying W Wranglers, SofaKillers Band & Inspector Magic show. Additionally, there will be a Kids Zone with free family-friendly activities, a Beer Garden (donation based), Food Truck Alley, free pumpkin patch (first come, first served), and vendor Marketplace. The best restaurants, breweries, distilleries and wine bars team up for three hours of dining and imbibing in Bancroft Park. The proceeds from the ticket sales support ongoing improvements to Old Colorado City Foundation. Cost: Free admission. Wine tasting tickets available for purchase. Take a drive up north and watch apples being pressed into cider. Bring your own apples and go home with cider! Music, car show and pony rides make this a fun family event. This 21+ event will leave you speechless! With over 70 of the best breweries, wine distributers and distilleries around the region and a little scary Halloween vibe from some of the best local scare houses, this event is one not to miss. Costumes are encouraged! Penrose-St. Francis sponsors this community event that features a full marathon, half marathon, and 5k. This family friendly race is a premiere endurance running event, attracting people from 26 different states. An amazing day whose proceeds help kids attend camp at Camp Shady Brook YMCA. Teams of 4 will race through challenges including orienteering/navigation, cross-country running/hiking, mountain biking, paddling and other challenges! There will be a large vendor area with interactive booths and a food truck fest. Ending childhood cancer is a worthy journey. Form a team, invite your friends and be a fundraiser for the kids of St. Jude. 10th annual Marathon of Trail Races is being held at Cheyenne Mountain State Park. This is a challenging race with well groomed trails that both start and finish at the Day Use Trailhead. This half marathon race has 3,000 feet of elevation gain and a top elevation of just over 8,800 feet. Race to the top of Cheyenne Mountain and back down in this out and back course to the south peak of Cheyenne Mountain. A 3 mile option is also available. Waldo Waldo – The Finale! If you have ever wanted to do this race, now is your chance. This final Waldo Waldo will be run as the 7th annual 5K fundraiser. Family-friendly event raises money for our local community. Runners of all ages and abilities are welcome-walkers and strollers too! For more information please see the event website. Cost: $35, day-of the event is $45, and includes a Waldo or Wenda kit that includes a shirt, hat and glasses.